A homeless man whose generosity made him the focus of a GoFundMe page is now suing the people who started the page, because they allegedly kept most of the money. John Bobbitt was homeless and struggling, but he had a good heart. When he saw Kate McClure stuck on the side of I-95, out of gas, he gave the young lady his last $20. McClure and her boyfriend, Mark D’Amico, repaid Bobbitt’s generosity by creating a GoFundMe page on his behalf. The GoFundMe page raised $400,000 for Bobbitt—but Bobbitt only saw $75,000 of the money. Meanwhile, McClure and D’Amico bought a home, a BMW, and began traveling and gambling at casinos. Eventually, Bobbitt began to wonder where the money was going. He found lawyers who were willing to investigate pro bono. And now, he has brought a lawsuit against the people who once pledged to help him. John Bobbitt, 34, was one of the people often seen at intersections, or by on-ramps, holding signs saying “Will work for food” or similar messages. Bobbitt staked out a corner by I-95 outside Philadelphia. He collected donations, slept under a bridge, and spent most of his money on drugs. He didn’t have a healthy life, but he was still a good person. When he saw Kate McClure trudging towards a gas station on that night in November 2017, he didn’t hesitate to empty his pockets for her. He knew what it felt like to be struggling. Bobbitt walked to the gas station for McClure, spent his last $20 to fill her gas can, and brought the gas back to her car, Fox reported. “Johnny sits on the side of the road every day, holding a sign. He saw me pull over and knew something was wrong. He told me to get back in the car and lock the doors. A few minutes later, he comes back with a red gas can,” McClure said on the GoFundMe page. McClure, 27, was impressed by Bobbitt’s selflessness. 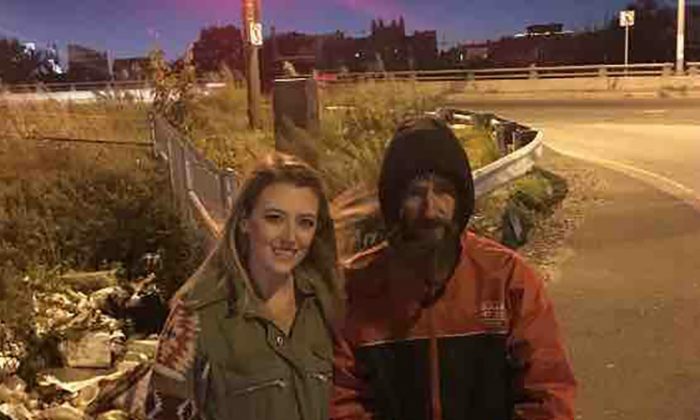 She learned that he had served in the Marine Corps, and had worked as a paramedic and firefighter, but had fallen afoul of drugs and the law and was not scraping by panhandling. McClure came back to Bobbitt’s corner with a jacket, gloves, a hat, and warm socks. “Me and my boyfriend Mark went back the next day. He gave him $100,” McClure said. “I was ecstatic,” Bobbitt told ABC. McClure became convinced that Bobbitt could get back the life he once led if he could just get a break—a boost to lift him out of the downward spiral. She came up with the idea of starting a GoFundMe page, hoping at first to raise $10,000. More than 14,000 people responded. As the donation total swelled, McClure and her boyfriend began promising, on the page to use the cash to buy Bobbitt his own home. The GoFundMe page claimed the money would buy Bobbitt the 1999 Ford Ranger he had always dreamed of owning, and would also be used to set up two trust funds, so Bobbitt could have an income but could not spend the entire principal. Within a week the page raised over $400,000 which totaled $360,000 after GoFundMe’s fees. So—why is John Bobbitt still broke and homeless? McClure and D’Amico claim that Bobbitt was given $200,000 in cash and merchandise, and wasted it all, funding the drug habit which he never managed to kick. The couple bought Bobbitt a camper and parked it on some property they owned. But later, they kicked Bobbitt off the property and sold the camper, keeping the cash. D’Amico kicked Bobbitt off the property in June, according to Crime Online, because Bobbitt was still using drugs. Meanwhile, McClure bought a new BMW, took trips to California, Florida, and Las Vegas. She went to New York City and bought front row tickets to the Broadway show “The Book of Mormon,” ABC reported. She also took a helicopter flight over the Grand Canyon, Crime Online reports. There are pictures of D’Amico sitting behind a stack of four million chips while playing in a high-stakes poker tournament at a Las Vegas casino. McClure and D’Amico also bought themselves a house. McClure is an administrative assistant with the state of New Jersey. D’Amico works as a carpenter. The sudden spending spree certainly raises questions. A judge in Mount Holly, New Jersey has ruled on Aug. 29 that McClure and D’Amico must provide a full accounting of the donated money—what was spent, and on what, and how much remains. The judge also issued an injunction against McClure or D’Amico spending any more of the donated money, according to Fox News. That same judge has also ordered all the remaining money be given to John Bobbitt, Crime Online reported. GoFundMe released a statement about the case, according to another Fox News report. “We are working with law enforcement officials to ensure Johnny receives all of the funds raised on his behalf,” the statement read in part. “While we assist law enforcement with their ongoing investigation, GoFundMe is also working with Johnny’s legal team to ensure he’s receiving support while the remaining funds are being recovered.